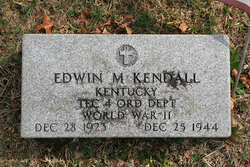 Edwin M. Kendall was born on December 28, 1923 to Dowl and Roxi Kendall. He attended the Corbin Independent School System and completed two years at Corbin High School. Some of the jobs Mr.Kendall had before he enlisted were a semi-skilled mechanic, repairman,and worked on motor vehicles. He enlisted in the Army on Match 29th,1943. He was a Private. He died on December 25th 1944 and is buried in his hometown of Corbin, Kentucky in Pine Hill Cemetery.